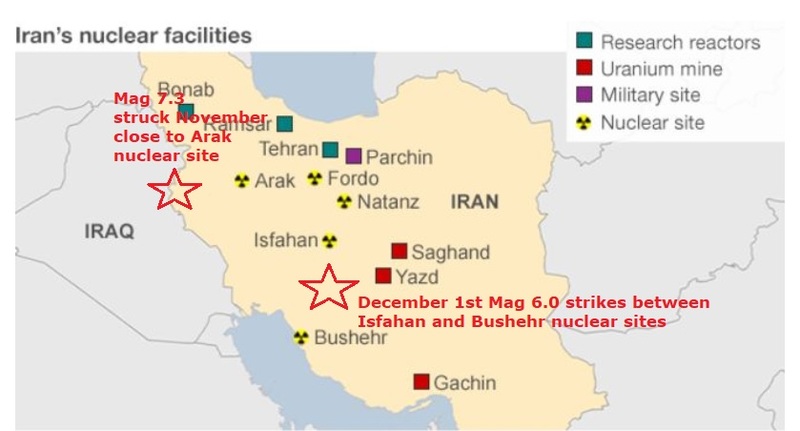 Iran has a number of nuclear sites, which are monitored by the global watchdog, the International Atomic Energy Agency (IAEA). Just three weeks after a magnitude 7.3 quake shook Iran leaving 300 dead and more than 70,000 people in need of emergency shelter Iran is under the earthquake cosh again. Three earthquakes hit eastern Iran in quick succession early Friday close to Isfahan and Bushehr Nuclear sites, the first a fairly strong magnitude 6.0 tremor that struck at a shallow depth close to the populous city of Kerman, the US Geological Survey said. 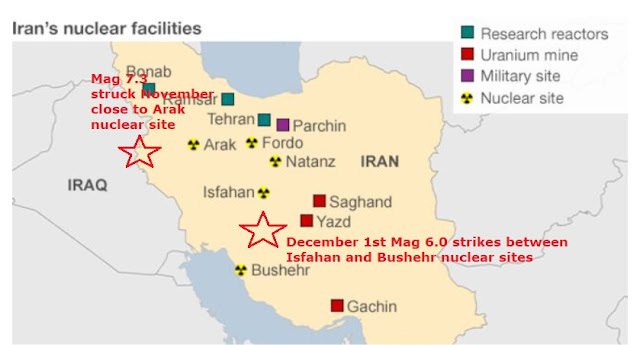 Today's quakes come just three weeks after the mag 7.3 struck close to the Arak heavy water reactor production plant leading to the question when will one of these nuclear sites receive a direct hit? It was followed by two less powerful 5.0 and 5.1 aftershocks in the same area, the survey said. "For the moment, no deaths have been reported but there has been destruction in several villages," Hossein-Ali Mehrabizadeh, an official with the crisis unit in Kerman, told state television. With the tremors hitting around 60 kilometres (37 miles) north of Kerman, USGS modelling predicted a low chance of widespread loss of life or property. The University of Tehran's seismology centre gave slightly different figures, announcing an earthquake of 6.1, followed by aftershocks of 5.1 and 4. The latest tremors come just over two weeks after a 7.3 quake killed more than 500 people in western Kermanshah province, close to the border with neighbouring Iraq. Iran sits on top of where two major tectonic plates meet and see's frequent seismic activity. Friday's quake hit around 200 kilometres northwest of the ancient city of Bam, which was decimated by a catastrophic quake in 2003 that killed at least 31,000 people. Iran has experienced at least two other major disasters in recent years -- one in 2005 that killed more than 600 people and another in 2012 that left some 300 dead. Today's quake is the first major quake of December and the 103rd of 2017.